carried oxidizer to fuel ratio (oxygen and hydrogen) must be reduced to 5 or less. That means at least an airbreathing rocket or airbreathing PDR to achieve that threshold. This equation set (4.14) is equations (4.12a) and (4.12b) repeated. Remember, in this equation the oxidizer/fuel ratio is the oxidizer/fuel ratio carried on the launcher with its associated weight ratio, not the rocket engine oxidizer/fuel ratio. The importance of the set (4.14) is that the gross weight is a function of one airframe parameter, OWE, and two propulsion parameters, and that the gross weight is directly proportional to the carried oxidizer to fuel ratio. Reduce the carried oxidizer and the gross weight and resultant engine thrust decrease proportionately. Beginning with the rocket point in Figure 4.29 at a weight ratio of 8.1 to the ACES weight ratio of 3.0, a straight line constructed between these points has all of the continuous hydrogen-fueled propulsion system lying along that line. Except for the PDR, the PDEs lie below the continuous propulsion curve, hence their fuel weight to OWE ratio is less than one. The PDR is essentially equivalent to the rocket in terms of weight ratio to orbital velocity. The PDE/ramjet is equivalent to a rocket-ramjet system and lies inline with the thermally integrated KLIN cycle at a higher oxidizer-to-fuel ratio and lower weight ratio. So the PDE/ramjet has an oxidizer-to-fuel ratio about one unit greater than the KLIN cycle and about one-half unit less in terms of weight ratio. In terms of characteristics the PDE/ramjet appears to be more like a thermally integrated rocket/turbojet than the airbreathing rocket propulsion systems. In terms of the impact on operational systems, the next set of charts will size launchers to the same mission and payload so these propulsion system differences can be evaluated in terms of launcher system size and weight. 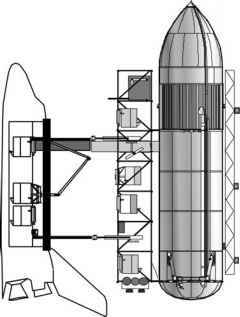 and payload capability for all these various configurations must be examined without bias to determine the best overall configuration to build. These ideas require further parametric investigation to finalize the comparison. So, while most conventional propulsion systems have fuel weight approximately equal to the OWE, the PDE propulsion systems have fuel weights that are less than the OWE, hence the advantage of PDE systems. This is a simple and fundamental relationship to judge hydrogen/oxygen propellant SSTO results. As shown in Table 4.6 for other fuels, the ratio will not be one. TWTO = vehicle thrust-to-weight ratio at takeoff; ETWR = engine thrust-to-weight ratio; WR = weight ratio to achieve orbit speed; OWE = vehicle operational weight empty.